I have a service that provides an API where I can download files with at HTTP GET command and basic auth. 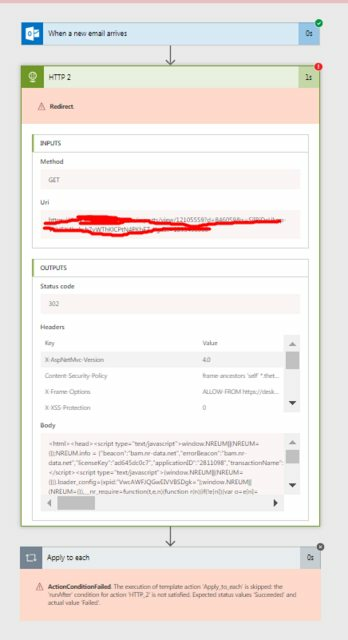 It works fine when Im testing the API with Postman but I cant find out how to download that file with Flow and for example put it in my onedrive. Anybody that could help me out a bit? In your scenario, I think HTTP action and the Parse JSON should be suitable to work. Thank you for showing me that! It was super cool to parse JSON respones. But unfortunally I dont know how to write a schema that will take care of a binary gzip file. Any idea? Yes it works! Sometimes the solution is so so easy. Thank you very much. kann you post screenshots of the solution you used? Does your link links direct to the file or is a Callback or Server Response? It seems that with JSON can be done but I also don´t know how to do it exactly. I would strongly apreciate your help! Its very simple. Works exactly as described above. Do an HTTP GET and create the file with the body response. Not sure what is unclear with the solution. Thank you for your feedback Ozcar. The problem with this settings is that the URL is a redireccion, and I get a 302 error. These are the details. Do you have any ideas to manage this URLs? No it seems to be a problem with response from the service you are trying to use. I dont have a direct solution for you but I recommend to use Postman first before attempting to get it to work in Flow. It just workt parsing the JSON. Thank you very much anyway. This is how I did it. Is this working still? I'm trying the same exact thing but I don't get the "Body" variable containting the csv data from the HTTP GET. Usually, when available it shows as Dynamic content but it's not there. I typed it it to no avail. Its working fine for me.